My name is Harry, AKA Harry-Barry, Harry Canary, Prince Harold, Harry-Barry-Barry, Barry-Boy, Bare, etc. My humans are crazy people. They love dogs but they don’t treat me right. I need my exercise every morning. I’m not talking about some polite jiggle on a leash and the sidewalks. I’m talking a real hunt. My humans keep repairing the fence I break out of because they are afraid I’ll get lost or get hit by a car. They’re really stupid about these things, probably paranoid. Most days, the closest I get to hunting is dreaming about it as I stare out the living room window. Ever day, several times a day, there is this black cat who roams the neighborhood. He doesn’t have a leash or humans and he must not have a good fence like mine. I bark at my humans but they tell me to be quiet instead of letting me go get the black cat. I try to ignore the black cat, to act above it all, but he is such a bloody tease, and he has the better life. He’s free. All of the squirrels are free too. They fly through the trees. If I was off my leash, I could fly through the trees. One day, my humans took me to the dog park. I know it sounds stupid, but it’s better than the sidewalks. The problem with the dog park is that there are far too many dogs, so most of the prey has long vacated the area. But this one day, you would not believe my luck! There was a black cat at the dog park! It wasn’t the same black cat, but I was off my leash and off I went. Oh my, I tormented that cat on a long chase. He climbed the tree, but I was smarter. I acted like I didn’t care anymore and started to strut back to my humans. When he thought the coast was clear and came down, I pounced. My humans are really stupid, and they were grossed out when I brought them my gift. I wanted to prove to them that they could let me free in our neighborhood – Look what I can do! I can clean up the neighborhood! But they were grossed out. They seemed to be mad. I don’t know what to do with myself. As soon as descent started, my ears started to shoot severe pain through my jaws and back into the middle of my brain. Then the nose bleed started. We did all the things you should do with nose bleeds, but it would not stop. I thought my brain had exploded. I’ve seen pictures of American hospitals from the 1940’s, and after we landed, they hurried me into a large room that looked just the same. In my semi-conscious state, all I could see were these massive metal instruments and these men speaking German, attacking me with the instruments. Finally, they informed me that I had an ear infection on both sides. Part of their treatment was to use one of their long metal pipes that narrowed, stick it in my ear and pour near boiling water down the pipe and watch run back out my ear into a harsh metal bowl that might otherwise be used for mixing deviled eggs. They stared at me. Poor little retarded boy. My high school orchestra from Colorado was on a ten-day European tour. I was on the program as a soloist in a concerto for my instrument and orchestra written by a relatively unknown but fiery Italian composer from the 18th Century. It was my moment in front of the world. It was the beginning of what I foresaw as a momentous career as one of the best musicians in the world. 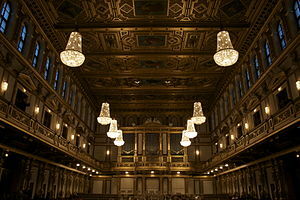 There was no warm-up show – We started the tour with a concert the night after landing in one of the finest concert halls in the world, the Musikverein, and we were to be on Austrian public radio with a purported listener base of around two million. This was the music center of Western music – Heaven for musicians. I get stage fright anyhow, but this was closer to panic when I continued not to be able to hear in all of the hours leading up to the concert. I told our director I felt as if I was underwater, my ears hurt like hell and I couldn’t play, but he was unsympathetic. We played a lovely Rossini overture as the opening piece. Then it was my turn. I came to the front of the orchestra. A huge, red, radio light sitting on a stand by our director turned on, letting us know that the radio mic’s were hot and we could start. I remembered shutting down my brain, and hoping to trust my feel of the instrument while stealing an occasional glance at the fingerboard. I could not hear my tone, so I counted on feel. I could not hear my intonation, so I counted on feel. There was a sea of people and I knew why they were staring at me as if I was a foreigner. It was a blur. During the wild cadenzas in all three movements, that short portion before the end of a movement when the soloist improvises without the orchestra in a manner like a drum solo in rock, I heard the sound with my underwater ears, and it was a glorious sound, but I attributed that to the magical nature of the hall we were in. People told me how good it was but they were not falling over themselves saying how great it was, so I knew it sucked. I tried to enjoy the rest of my trip feeling as though I had failed, bitter that I could not be the musician I wanted to be. I remember reflecting peacefully. Thinking is the best way to travel. I remember practicing in my room until late into the night, waiting for my Mother’s three foot stomps upstairs to indicate quiet time, dreaming of playing in the Musikverein, being labeled as one of the greatest musicians to grace the Viennese air waves. Dreaming in my room, I created the best musical tour ever, one that was far better than the one we had. This is another contribution to the Inspiration Monday. This is #8. Go check out the marvelous output from others. This one was done in response to “Thinking is the best way to travel.” I am barely in under deadline, and no matter how much cutting I did, I broke the word count rules by quite a few words.